Cluster headache is classified as a primary headache disorder. A headache disorder is classified as “primary” when the cause is unknown. No one knows for sure because there hasn’t been enough research on cluster headache. The current theory is that changes in the hypothalamus are involved in setting off a cluster headache attack. There have been a few small studies that explored a genetic link, but found nothing definitive. In 2016, The Will Erwin Foundation partnered with the Memorial Hermann Health System and The University of Texas Health Science Center at Houston (UTHealth) Medical School to look for genetic markers for cluster headache. The study has not been completed, so we won’t know the results for a few more years. Cluster headaches are horribly painful. It is not uncommon for new patients to fear that the pain is a symptom of a life-threatening brain disease or that the pain itself may cause permanent damage. However, this is not the case. The real danger of cluster headache lies in the helplessness, anxiety, and depression that often follows such excruciating and unrelenting pain. Despite what you may be feeling, there are treatments that can help control the symptoms. If you are feeling overwhelmed to the point of considering suicide, please reach out by calling 800-273-8255 or going to your nearest emergency room. There is nothing specific to prohibit a cluster headache patient from driving. However, every city has laws against driving while impaired by medication or health condition. It is certainly not safe to drive during an attack. Depending on the treatments you use to abort or prevent attacks, it may or may not be save for you to drive even between attacks. Because each patient is unique, please discuss this issue with your doctor before assuming that you can or cannot drive safely. There are no medical tests that can diagnose cluster headache. However, your doctor may recommend testing to rule out other conditions similar to cluster headache. Once other conditions are ruled out, diagnosis is based on your report of symptoms. There are specific criteria listed in the International Classification of Headache Disorders, 3rd Edition. Because cluster headache is so rare, few doctors are able to recognize it. Most will never meet a patient with cluster headache in their practice. The best option is to find a UNCS board-certified headache specialist who has specific training and experience diagnosing and treating cluster headache. How do I find a headache specialist? Finding a specialist who treats cluster headache can be a bit challenging. The best option is a neurologist with advanced training in headache medicine. You may also ask your family doctor for a referral, search online or ask other cluster headache patients for recommendations. How do I stop this horrible pain? As you may have already discovered, the pain of a cluster headache doesn’t respond well to typical pain relievers—even powerful narcotics. In the short term, patients often find relief from breathing in high-flow oxygen or using sumatriptan injections. In the long run, a good preventive regimen can reduce the frequency and severity of attacks. For some, these measures stop the attacks completely. The important thing to remember is that not everyone responds the same. You may need to try a lot of different treatment options before finding one that works best. A trigger is something in the environment that sets off an attack. Triggers are unique to each person and can include food or drink, sounds, smells, sleep quality, and even stress levels. A trigger is not the same as cause. You can discover your unique triggers by keeping a headache diary. A headache diary is any tracking system that is used to record each attack, time of onset, duration, treatments used, and any potential triggers. There are many mobile apps that can be used to track attack frequency. However, some prefer to use spreadsheets, or even paper calendars. Any of these methods will work. Which you choose is a matter of personal preference. We have an example of a simple headache diary available for download. What are the best treatments for cluster headache? A combination of abortive, preventive and bridging therapies are the best. Abortive treatments most often used are oxygen and injectable sumatriptan. The first-line preventive is often verapamil and the most common bridging therapy is prednisone. There are many more options to choose from, so don’t give up if the first treatment plan isn’t effective. How do you use oxygen? The approach is to use 100% pure oxygen at a flow rate of 12-15lpm, sometimes higher, through a non-rebreather mask for approximately 15 minutes or until the attack is stopped. Although that sounds pretty straightforward, learning how to use high-flow oxygen for quick relief takes some know how and practice. Take a look at our comprehensive guide. How do I convince my doctor to prescribe oxygen? If your doctor is reluctant or dismissive of oxygen for your treatment and you have been diagnosed with cluster headaches, do not take “No” for an answer. Providing the doctor with a printout of the JAMA High-flow Oxygen Study and respectfully pressing for a rationale regarding denying the appropriate treatment will usually suffice. As in all things with a rare disease like Cluster Headaches, it’s important to build some rapport with the doctor and assume that they are working in your best interest, but may not be very familiar with this disease. If you find too much resistance, consider going to another doctor, preferably a headache specialist neurologist. If the doctor is reluctant to prescribe O2, he or she will probably be reluctant to provide you with adequate preventative medication as well. Find out more in our comprehensive oxygen guide. My insurance won’t cover oxygen. What can I do? It is possible to purchase your own mask, regulator, and tubing by shopping online. From there, it is simply a matter of finding an oxygen supplier willing to rent tanks to you directly. The initial setup cost is usually less than $100. Ongoing costs will vary based on the size and quantity of tanks needed. The most popular size tank, the E tank, can often be rented for $10 – $15, depending on your supplier. For detailed instructions, visit our oxygen setup guide. Where can I find the right kind of regulator? The company that provides your oxygen tanks will provide a regulator as well. If you do need to purchase a regulator be sure it is appropriate for the tank you are using. Different tank types use different regulators due to tank pressures. 0-25 lpm regulators for E tanks are readily available online. Where can I find non-rebreather mask? The company that provides your oxygen tanks will provide a simple, inexpensive non-rebreather mask. Some cluster headache patients find that this type of mask works well. However, if you have difficulty with mask fit or find that you can’t get a good seal, you may want to consider a non-rebreather mask made specifically for cluster headache. The ClusterO2 Kit is made to provide an air tight seal that maximizes the effectiveness of high-flow oxygen to abort cluster headache attacks. How do you split sumatriptan injections? Please see our detailed instructions on how to split sumatriptan injections. Are there surgeries that fix cluster headaches? 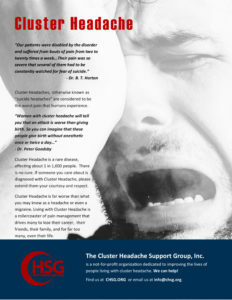 There is no cure for cluster headaches. There are a few surgical options that have limited success for some patients. However, these are not first-line treatments for cluster headache. They are a last resort when all else has failed. The surgeries that are available block pain signals through neuromodulation. These are invasive procedures that carry the same risks as any major surgery. Choosing a surgical option is something that should be carefully discussed with your doctor, weighing all the risks and potential benefits. They are no guarantee of relief. What is the Vitamin D Protocol? It is a nutritional supplement regimen originally developed by Pete Batcheller. Although not subjected to rigorous, scientific double-blind, placebo controlled studies, this protocol is popular among cluster headache patients as a preventive therapy. You can learn more about it in our treatment options directory. Will daith piercing help cluster headache? There is no scientific evidence to support daith piercing as a treatment for any headache disorder. It is more likely to cause harm than help due to potential infections and delays in utilizing effective treatments. Any relief that is experience is likely due to placebo effect, which will eventually disappear. To learn more, visit Debunking the Myth of Daith Piercing. Will cannabis help cluster headaches? There have been few studies on the use of cannabis to treat cluster headache with inconclusive results. There have been no double-blind, placebo-controlled studies to support it as an effective treatment. Anecdotal reports (patient stories) have been mixed. How can FMLA help protect my job? FMLA refers to the Family and Medical Leave Act, which is a federal law that guarantees certain employees up to 12 workweeks of unpaid leave each year with no threat of job loss. FMLA also requires that employers covered by the law maintain the health benefits for eligible workers just as if they were working. To be eligible you must have worked for their employer for at least 12 months, and have worked for at least 1,250 hours over the previous 12 months, and work at a location where at least 50 employees are employed by the employer within 75 miles. Can you get disability for cluster headaches? Social Security requires that you must be disabled for at least 12 months to qualify for benefits so for chronic cluster headaches yes you have a chance of qualifying and for episodic cluster headaches most likely not. Please see our detailed disability guide. Does cluster headache run in families? Compared with the general population, first-degree relatives have a significantly increased risk of having cluster headaches. However, there seems to be no clear mode of inheritance, suggesting that both genetic and environmental factors are of importance, with the pathophysiology being multifactorial. Research is ongoing to verify a hereditary link. Do women get cluster headaches? Experts tell us that men with cluster headache outnumber women 3:1. That does not mean that women don’t get cluster headache. According to a 2001 study published in the Journal of Neurology, Neurosurgery and Psychiatry, women with cluster headache were more likely to develop symptoms earlier in life and experience more migraine-like symptoms such as nausea and vomiting. Can children get cluster headaches? It is rare and often misdiagnosed, but children can have cluster headache. The key characteristics are a history of “thrashing around” or other strange behavior during attacks. These symptoms are often misunderstood, so if you suspect your child may have cluster headache, it is vitally important to consult with a board-certified pediatric headache specialist. Does cluster headache ever go away? Cluster headache is a lifelong condition. Most people with cluster headache experience active cycles followed by symptom-free periods. The time between cycles can be as brief as a few months or last for decades. It is common for patients to experience cluster cycles during seasonal changes. A smaller subset of patients experience attacks more frequently with less than 30 days between active cycles. It is important to understand that a long period of pain-free time does not mean that you are cured. Cluster headache can and does return, even after decades. The healthy attitude to adopt is one of enjoying each pain-free moment without the false belief that you are cured. Cluster headache is not the kind of medical condition that develops because of lifestyle choices. As far as the experts know, there are no documented risk factors for the development of cluster headache. The onset of symptoms usually occurs before age 30. It is a lifelong, incurable condition with no known cause. In the past, it was believed that only men with a history of smoking, drinking, and/or recreational drug use developed cluster headaches. While men still outnumber women 3:1, cluster headache can affect anyone, regardless of lifestyle. You did not do anything to deserve cluster headaches. Why don’t people believe me? Almost everyone has experienced a headache. In most cases, a simple over-the-counter analgesic is sufficient to stop the pain and allow a person to return to normal activities quickly. Society’s view of “headache” does not include the excruciating pain of a cluster headache. It is difficult for most people to comprehend that such severe pain has no known cause. They expect that level of pain to be the result of a brain tumor, stroke, or anyeurism. Even people who live with migraine can have difficulty understanding cluster headache because our behavior during attacks is often the exact opposite of a migraine attack. While we may be treated with similar preventive medications, our abortive treatments are very different than the oral triptans used most often to abort migraine. Probably not, but it may feel like it. Cluster headaches can bring on a lot of various other symptoms such as depression, anxiety and panic attacks, especially if your cluster headaches are not well-managed. Speak to your doctor or specialist and seek out help for the other symptoms that may accompany cluster headache. Help! I don’t think I can take this anymore.